Pediatric Dentist: Is Tap Water Better for Your Teeth? Is Tap Water Better for Your Teeth? According to the LA Times, over fifty percent of children will experience tooth decay before the age of five. 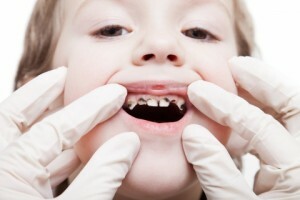 There’s no doubt about it, tooth decay in children is on the rise in the United States. Of course a diet high in sugary snacks and drinks is a big part of the problem, but there is another source that not many people think too much about, bottled water. Pediatric dentists everywhere have been trying to encourage parents to forego the fancy bottled water and give their kids tap water. Bottled water has been sweeping the nation over the past few years, and many people drink it as their primary source of water. You have many options when it comes to bottled water: mineral water, sparkling water, spring water, etc., which only makes it all the more attractive to us. However, bottled water is also missing one very important ingredient for your teeth, fluoride. Fluoride helps to protect our teeth from decay, and introducing a controlled amount of fluoride into our drinking water is one of the most affordable ways to combat the growing occurrences of tooth decay. That is why our family dentist suggests ditching the overpriced bottles of water and giving your kids tap water! Tooth decay among children is a huge problem in the United States. Keep your child’s teeth healthy by cutting down on the sugary treats and giving them good old fashioned tap water instead of bottled water. We are lucky enough to live in a country where tap water is not only safe to drink, but also healthy for your teeth, so why not take advantage of it?